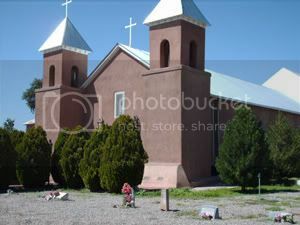 Monday was filled with an quickly planned trip to Española (Santa Cruz, actually; didn't go all the way into Española) for the funeral of Bertha Martinez, the mom of my friends Ymelda and Dodi. It was in a church in which I played and sang for guitar masses when I was in high school. (I was Baptist, but friends wanted me to help with the music.) It's a beautiful church. Holly was with me. We went to the cemetery. I had brought the coordinates of the graves of my dad and of my friend Charles Montoya. I will add to those pages, as I come across things. Then we went to the Upaya Zen Center to deliver a couple of boxes of books for use in their prison outreach program, and on to the reception, which was at The Immaculate Heart of Mary Retreat, off the Old Santa Fe Trail near St. John's College. It was a good day in northern New Mexico, and nice day with Holly. She helped me take notes on things I want to be sure and include in the talk called "Big Noisy Peace." On the early edge of last weekend, Lillian Jones was here for a couple of days. That was fun! On the latter edge of this weekend Diana Jenner and Kelli Traaseth and their families will be here a day and a half or so (two sleeping nights) before the conference. Busy week, but lots to look forward to. Same-same, but two weeks instead of three. I'm ready enough to do it now. I'll be more ready then. Kirby bought a new computer. A Gateway with a spiffy new-style screen and a zippy video card. He's been rearranging the desk-end of his room. I hope he sleeps a little before morning because he was sick early in the week. He missed a day of work. Holly's the sickest of the three of them, and Marty hurt his foot somehow, so came home from work early today. Rather he went in even though he was limping and in pain, because from 6:30 to 10:00 he's the only checker. At 10:00 he came home, let me put mineral ice on him, sat in a recliner with his foot up, and watched 16 Blocks with me. Ah... Bruce Willis and Mos Def. Nice combo. Everyone was eating leftover chicken noodle soup I made last night. I wish I had eaten more of it. It was good, but I figured those individual-serving-sized sets of leftovers should be for sick kids. If I'd had a bigger pot, I might've made more. Kirby seems all recovered after only three days, so that bodes well for the others. I worked on Thinking Sticks today, and web pages. One is to sell and the other's out there free and open. I recently went through and touched up the typical days pages. Added borders to all and art to a few. Repaired old links and references. It was fun to read them again. Inspiring. Another, less important, is http://sandradodd.com/flowers. Several other things happened, but all peaceful and fairly quiet and comforting and I'm tired now. 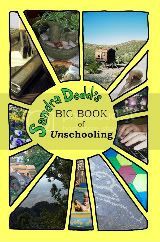 In three weeks there's a big unschooling conference in Albuquerque. It seems such a short time! But unlike with conferences in other states, there are some things I don't have to worry so much about. I don't have to decide which clothes to take; I can come home to my closet. Someone can come home and feed the cats and the dog. Keith and I will probably stay home most nights, and kids might be in and out because I don't know if the boys will take all those days off. There will be people staying with us on either end of the conference, I think, at least little visits. I ordered more copies of Moving a Puddle, a couple of weeks ago. Rue Kream had two crates of Parenting a Free Child sent here from the publisher. Mine should arrive soon. I've been making sets of Thinking Sticks, which is a pretty involved process, with three inserts, two of which needed to be updated, then they're printed and intricately folded and blah blah blah... Holly and I have been collecting tie-dyed garments for resale as frolicking clothes and cheap souvenirs. Some of the things are clothes from when she was younger, but some we've found at thrift stores. We've had fun outings. Every day or two I think of something good to add to the talks. One is called "Big Noisy Peace," and the other "Flow." I've spoken at over two dozen conferences now, and usually do two to four presentations. It seems I'd be more used to it now, but the whole thing still looms large, and the days are starting to go by more and more quickly. When I'm feeling stuck, I go and pull weeds or gather kindling or switch out the laundry. While I'm doing non-verbal things, verbal thoughts come to me. When I'm doing verbal things (reading e-mail or working on my website-without-end), the non-verbal things come. Same as usual, only more urgently as the conference comes nearer. Holly and I saw this cloud over the mountains today. The mountain is a mile higher than Albuquerque, so you can kinda gauge how high the cloud is. 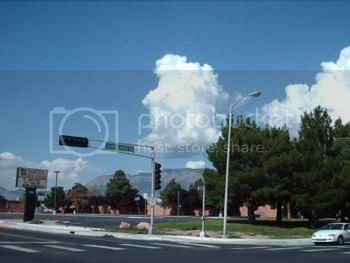 Here's a clearer view also near Sandia High (Candelaria and Pennsylvania, in northeast Albuquerque). The top of the mountain is two miles above sea level. Look how much higher the clouds go! The third photo is from inside our house, ten minutes or so later. I posted another photo of the Sandia Mountains out that window here. I couldn't use that angle for these, though, because the clouds were cut off halfway up, so I had to sit down low and aim up to get the tops of them. That's the window frame up in the corner of the photo. Those are some big clouds. Thunderheads. We've had out-of-state coastal-resident visitors recently and I was trying to describe how big those clouds get and how distinct they are from the sky. They don't kind of trail out at the edges. Sometimes there will be just one single one, and it will rain out the bottom on a spot not much bigger than it is. Sometimes the rain doesn't reach the ground, but evaporates partway down. I'll try to get photos of that. It's called verga, the rain you can see that doesn't reach the ground. That only happens on very dry days, though, and today is downright muggy. 68% humidity. The rain is always cold here. I was surprised when I felt warm rain, for the first time as an adult, in Pennsylvania. I thought all rain was cold. I was working on my movies page, making the list below, and realized that they're all about parenting. I don't think any of them seem like it, from the previews, which is the topic of that page—movies that are made to seem really scary by their trailers, but aren't so scary. I was afraid to watch it for a year, and finally rented it and planned a daytime viewing. That fear came from the trailer. There is value in the trailer, but if it keeps you from seeing the movie, that would be a shame. I love Robin Williams which is why I watched the movie, but it's easy to forget it's Robin Williams, beause he is playing in every possible way opposite of the person he is, except for a kind of sweet sadness. This is not a horror show or a slasher movie. Don't get me wrong, this one is hard to watch and it's violent and there's blood. To judge from the trailer they showed in New Zealand, it's nothing BUT that, and that turns out to be the case. Living in New Mexico, I saw the NZ trailer after I watched the movie on DVD. I had already had some Kiwi Unschooling moms say they couldn't or wouldn't watch it, though. Having seen that trailer now I absolutely understand why. Still, I'm glad I saw it. I don't think I would watch it with pre-teens. Anyone wanting more excellent vague advice can write to me at the address in the bottom notes below. There are certain sensitivities that might make it more difficult for some than others. It wasn't until I had written all of what's above and got to the last note about "certain sensitivities" and was thinking about mothers that I realized all three of those movies can bring about a great deal of thought about parents and children. The not-so-scary page is here. I don't want anyone to post comments here that give away any plot parts or endings. Thanks.